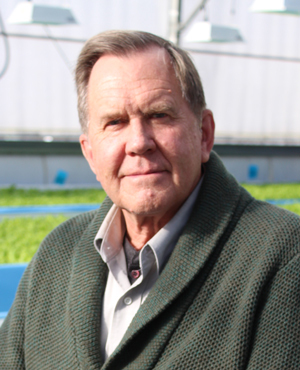 John Pade, co‐founder and co‐owner of Nelson and Pade, Inc.®, has been actively involved in soilless food production and indoor farming since the mid 1980’s, as a grower, builder, system developer, consultant, author and educator. In the early 90’s, along with his partner, Rebecca Nelson, he began studying aquaponics and building and designing aquaponic systems. Since that time, Nelson and Pade, Inc.® has designed, built and shipped economically and environmentally sustainable aquaponic systems of John’s design that number in the hundreds and are utilized in the U.S., Canada, Mexico, the Caribbean, Europe and Asia. John has designed the patented ZDEP® aquaponic system, which dramatically increases food production while decreasing waste. John has taught aquaponics to individuals from 85countries in Nelson and Pade, Inc.® Aquaponics Master Class® and in the UWSP Introduction to Aquaponics course. 2005 – 2012 – Designed, developed and launched the first complete line of aquaponic systems available for applications ranging from hobby to commercial. 1985 – Built first large scale hydroponic greenhouse in U.S.